This is a picture I took on Wednesday evening at Doreen’s house. 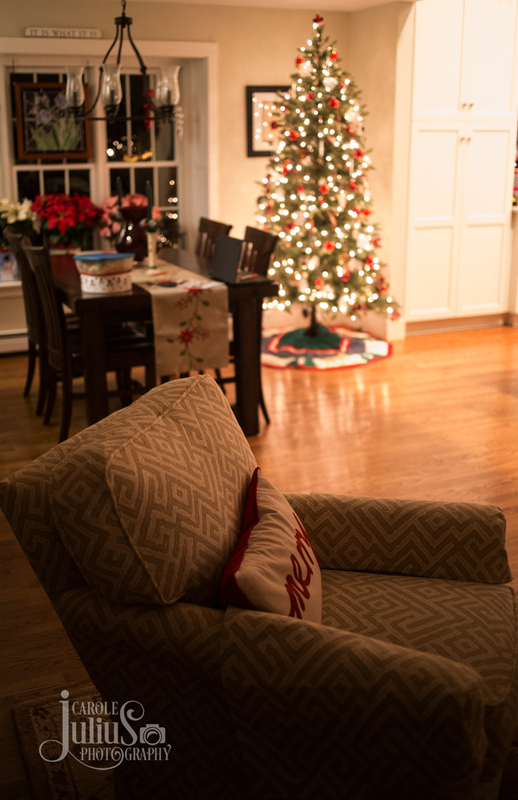 You can see one of her 2 new chairs in the foreground with her dining room and Christmas tree in the background. It’s cozy and inviting and I think it illustrates pretty well why every time I go there I never want to leave. I hope you find someplace cozy and lovely to hang out this weekend – a quiet moment or two in the hustle and bustle of the days leading up to Christmas can be truly welcome. Oh, yes! I can see exactly why. . . Enjoy the weekend, Carole! What a pretty cozy picture! I love Doreen’s new chairs and need to find something like them for my own home! Have a cozy, lovely weekend!! Doreen has great taste…in decor and friends! ahhhh….lovely. cozy and warm and oh so inviting. I’ll bet her kitchen was, too! That is an absolutely beautiful runner on the table. Such a lovely space.